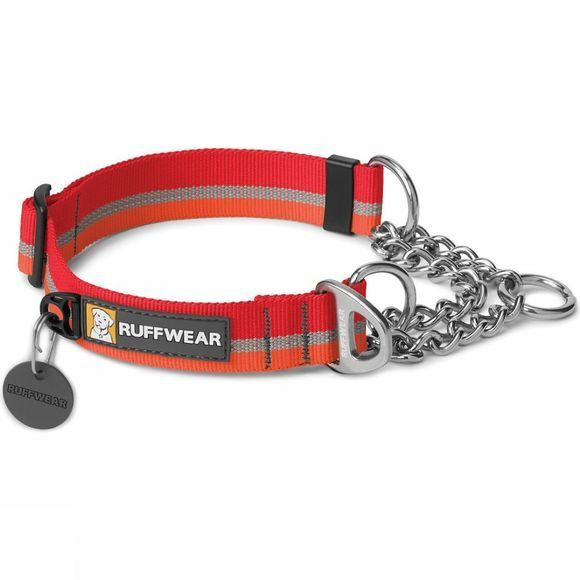 The Chain Reaction Dog Collar from Ruffwear is a martingale-style collar that combines Ruffwear-designed TubeLok webbing and a short section of stainless steel chain. This collar provides limited correction with an audible cue, making it a great training tool. A single-piece, anodized aluminum V-ring provides a secure leash attachment point. You can easily add or remove identity tags with the Quick Ring and tag jingle is reduced by the with silicone silencer.